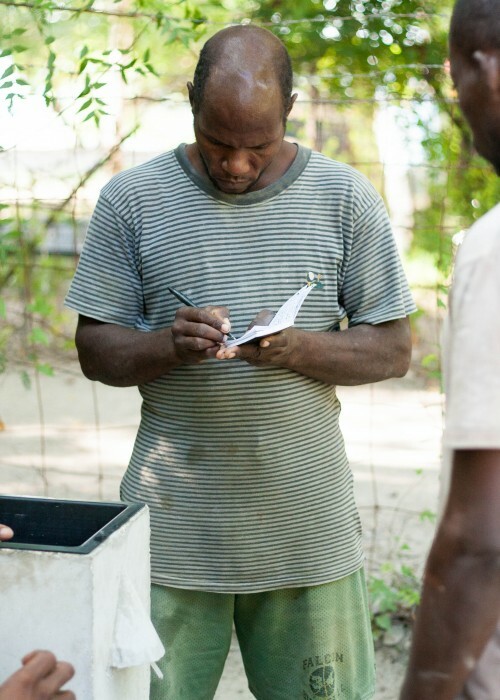 At Clean Water for Haiti we want every home in Haiti to have access to clean water. For us, that means we would love to see a filter in each household until there are other long term solutions in place. But, we know that it’s not possible to see our goal achieved by our organization alone. Haiti has a population of about 10 million people. That’s a lot of filters! Our solution? Teach others. By providing training opportunities for other organizations we can use our many years of expertise to equip people to do what we do. It’s a win win situation! Clean Water for Haiti is one of the largest, continually running bio-sand filter projects working not just in Haiti, but globally. Since our start in 2001 we’ve installed over 21,000 filters. We also have a proven track record – data shows that over 95% of our filters are still in use after the first year. We can offer over 13 years of on the ground experience in Haiti – something that’s invaluable. Theory is good and needed, especially when working in a technical capacity. But, theory will only go so far. Students who attend our training classes will not only learn theory about household water treatment and the bio-sand filter, they’ll learn real, practical lessons about how to run and maintain a bio-sand filter project in Haiti. Hands on experience is one of the best training tools there is. Students will have a lot of hands on construction and installation training, as well as several project implementation exercises through the week. All of our training staff have been working with Clean Water for Haiti for about a decade. That’s a decade or more of on the ground experience being passed on to your organization. Our staff also spend a lot of time answering questions and testing student comprehension, as well as troubleshooting issues. We attempt to address the struggles encountered with running a project in Haiti by addressing cultural issues, resource problems, and other challenges that we have encountered ourselves. Organizations who train with Clean Water for Haiti are given access not only to our knowledge and expertise, but can also purchase steel filter molds at cost that are manufactured on site and extensively tested. We also sell tubes and diffuser basins, necessary filter components, to CWH trained organizations at cost as a means of encouraging your production and project success. When students attend our Bio-sand Filter Technician Training they’ll spend five days doing intensive theory and practicum time. Students who are successful in the class will receive certification as a CWH trained Bio-sand Filter Technician. Classes are offered on an as needed basis several times per year. We can accommodate 10 students in each class, and teach in both Creole and English as needed. Classes run Sunday – Friday. Students need to come prepared to work with sand, gravel, concrete and lots of water. The cost per student is $250 US. This fee includes all training materials and class time, 3 meals per day, and accommodation in our on site guest house. Fees can be paid in advance by sending a check to our US or Canadian organizations, paying online, or on the first day of class by check or cash (US or Gourdes). Please confirm you method of payment at the time of registration with our staff. All accommodation for trainees is provided in our on site guest house. The guest house is screened, has full bathroom facilities, and fans. Students are required to bring their own towels and toiletries. All bedding is provided. Meals are prepared by our Haitian cooks and served three times per day. Students arrive by 5 pm. Evening meal provided. 7 – 10:30 am – Theory sessions with one hour breakfast break. 10:30 – 4 pm – Practicum sessions with one hour lunch break. 5:30 pm – Evening meal. 7 – 8 am – Revision and Q&A with theory teachers. 8 – 9 am – Breakfast break. 9 – 11:30 am – Practicum final session. 11:30 am – Diplomas for certified students. 12:00 pm – Lunch served and students depart. Please note: Students must arrive Sunday. Any late arrivals will be not be admitted into the class and a partial refund will be issued to the sending organization. Most people think that training is the place to start when trying to get a Bio-sand filter project started, but it’s actually one of the last steps. Our goal is to see you succeed so more people can have access to clean water in their homes. In order to help you do that we want to help coach you through the first stages of putting things in place before you ever send us students to train up into filter technicians. Students who come for training and then have the opportunity to put their new knowledge to work right away are the ones who can make the biggest impact in their communities. Because of this the registration process is just that – a process. Use the form below to get in touch with Chris Rolling by email at info@cleanwaterforhaiti.org to introduce yourself. Let us know what organization you’re working with, what part of Haiti you’re working in, why you want to start a filter project in your community, and whatever other questions you might have. After receiving your email Chris will be in touch with you to answer your questions and walk you through the first stages of getting ready to start a filter project. After Step 1 is complete Leslie Rolling will contact you about scheduling a class. We try to schedule classes several times per year as needed, and based around Clean Water for Haiti’s existing schedule. Whenever possible, we try to include several interested organizations in the same class so that more people can benefit at the same time. Leslie will work with you to register your students and will provide you with the necessary information to pass on to them concerning dates, location and anything they need to bring with them. It is the organizations responsibility to ensure this information is communicated to your students. Note: Whenever possible we encourage the sending organization to send a staff or volunteer person who will be working closely with local Haitian staff on the project. Attending the class means that your organization will have a better understanding of what’s involved in running a project, as well as helping with accountability as your project is established. Once you’ve confirmed the number of students you’ll be sending you can make arrangements for payment. Fees can be paid directly to our US or Canadian offices, or paid at the start of class by check or cash (US or Gourdes). Training fees are for a provided service so no tax deductible receipt can be issued. We highly recommend and encourage projects to purchase filter molds and a supply of tubes and diffuser basins before or at the time of training so that their students can get right to work. You will be provided with all the necessary information to purchase these materials during the registration process. Note: Our full time in-country and local staff are responsible for all preparations and teaching for training classes. We love to provide this service to other organizations, but also recognize that it is a division of our time and resources. Because of this organizations will only be refunded 50% of the training fee for students who fail to arrive on Sunday prior to the start of class. IMPORTANT: Training classes are a paid service offered by Clean Water for Haiti. After the close of the class we are happy to support your organization by selling some of the filter components at cost, and by providing our knowledge and expertise as a resource. It is the obligation of the sending organization to secure funding and do promotion for their own filter project activities. Attending the class does not form a partnership of any kind with Clean Water for Haiti and cannot be stated as such in any promotion for your organization/filter project.